Here’s the scenario. I’ve got a charter school that has an aaaaaaancient PBX kicking a PRI. Having the system updated is expensive and the PRI is even more expensive. We are going to roll a new PBX for them in about 8 months, and their PRI’s contract is coming up soon. This is a perfect time to switch them to a SIP trunk and put in a temporary PBX for them. I’m using my lab 2621XM running CME4.1 as their temp PBX. We are loaning them some 7912s that we had sitting on the shelf. Beyond that they needed some analog lines. Analog lines come in two flavors, FXO and FXS. FXO ports would be the ports you use to terminate a standard phone line from the telco. This would be what you would use to terminate regular pots line you get from the phone company. 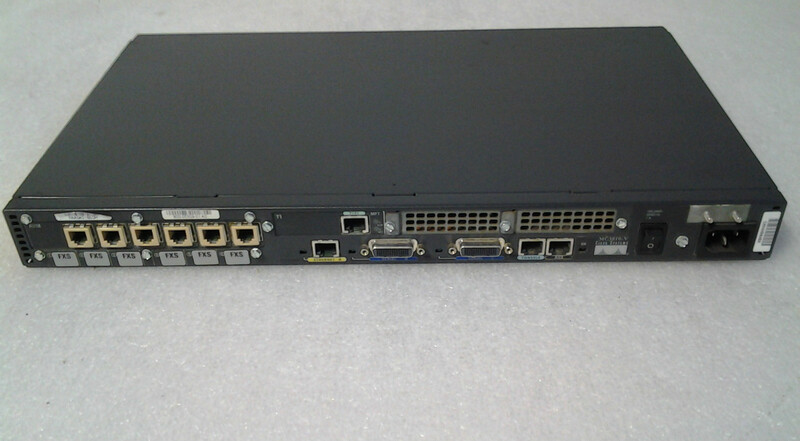 FXS ports are the interfaces you would terminate an analog phone or fax on. In our case we have fax/stamp machines to terminate so we needed 5 analog FXS ports. You can get standard ata 186s, but they retail for around $120 even on ebay. 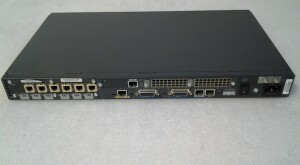 These will get you two FXS ports. 3 of these would cost us over $400! This is a little much to stomach…really just because I’m so cheap. I happen to have a secret weapon…the Cisco MC3810! These little beauties are ancient, but can be hand for a song on ebay or via your favorite distributor. They support up to 6 analog ports and can be any combination of FXS, FXO, or EMI ports. They will often come with a T1 interface also! You will want to get a “show ver” off of the unit prior to ordering it just to verify which analog ports are installed. The only down side to using the MC3810 is that call routing will need to be manually done…which isn’t too huge an issue really. For the cost savings it is worth spending another 30 minutes on configuration, right? Last, I don’t have Unity Express(CUE), so I decided to use Asterisk as a voicemail server. There are some links that show how to properly use asterisk as a VM server, but I’m doing it my own way…would you expect anything less? I’m using elastix as my asterisk install. It is basically centos on an installable disk that once inserted will format the hard drive, install centos, and last install all necessary packages. This makes going zero to VOIP pretty easy. This gives you an interactive prompt response to quickly setup some basic facilitites. If you tell it you have 10 phones it will start with the “first extension” and create sequential extensions. I’m adding some exclusions to my DHCP. .2 will be our VM server and .3 will be our MC3810. Setup an ethernet interface to connect the router to the phone network. Setup the web interface to our CME. 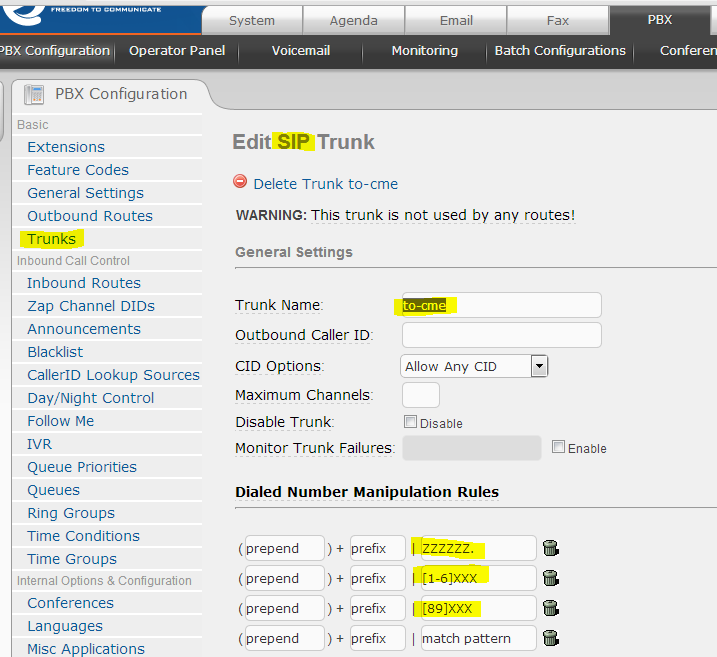 Configure the SIP trunks over to our MC3810. We have 5 analog lines configured with 5 different extensions. Our extensions will be 8949 and 8950 through 8953.
destination-pattern 8949 !if this pattern is dialed exactly it will match. The destination pattern matching can be a bit tricky. Here’s a friendly chart that explains the whole mess. Here’s our SIP trunk to the VM server. destination-pattern 7... !any of our VM accounts are in the 7000 - 7999 range. Thus we route all of this to the VM server. We also need to configure our voice translation rules. These take either a called or calling number and translate it to something else. We are going to use this to translate the 10 digit dialed number someone calls from the outside to our 4 digit extensions. This first rule will be used when someone calls in to us. It takes the 10 digit dialed number and drops the first 7 digits and appends an 8 to the front. This will be used for outgoing calls. It will drop the 8 from the beginning of the extension and prepend the rest of our 10 digit number. We will assign this to our phone provider. In our case this will come from a SIP provider, but this could also be assigned to a PRI interface. Since we will be using 9 to dial an outside line, it will take the 9 and drop it leaving only the remaining dialed digits. Now we assign the above rules to translation profiles. translate called 1 !this manipulates the number someone out in the telecom world called...one of our DIDs. At this point you can log into CME’s web interface to customize your extension(adding descriptions and the like). We will want to set the “call forward busy” and the “call forward no answer” to the extension’s specific VM account. Voice ports represent the physical ports. Here we just put descriptions. To assign an extension to the phone you just create a dial-peer that has an exact match to the extension, then send it out the proper port. At this point we can plug a standard analog phones into the various ports and dial each other…pretty easy, eh. The following dial peers send any calls that don’t live off of the analog ports out to our CME. !the following are very nit picky patterns to work around our extension scheme. So lately I’ve been using Elastix because it is so simple…and I’m so lazy. It has the standard freepbx interface that you are accustomed to. Give it a name “to-cme”. I then give it three dialing rules. Basically anything that is 7 digits or more, or any 4 digit extension that isn’t in the 7000 range. 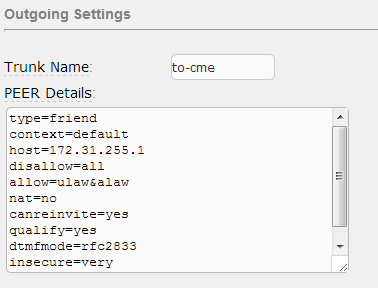 The host should be the IP address of your CME. 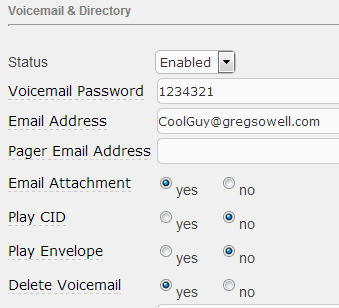 Now setup the voicemail accounts for your accounts. 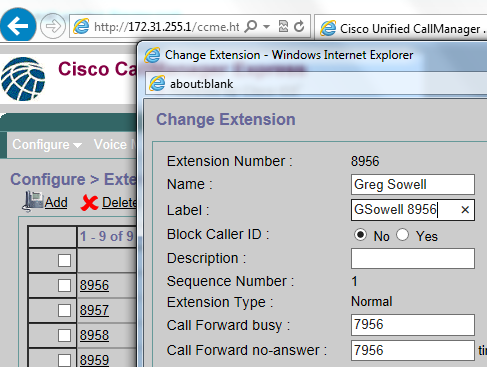 If our extension is 8956, then our voicemail account will be 7956. 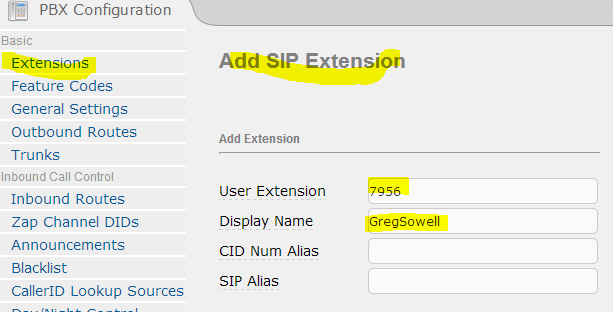 Create a standard SIP device and have its voicemail dump to the clients email.